I should mention that by this point the camera on my phone has got a really bad case of dust intrusion. Aye, the phone that’s dustproof and waterproof. I’ve managed to clean it since but not completely, and it’s only a temporary fix. I’m on the case! Haha, case, geddit? Because the case is the problem. Haha. Okay. I’m also trying a new format here, with headers to break up the story a bit better. Chekkit! Anyways, I landed and got to the terminal train what leads directly into the city, dead straight-forward stuff. I got off at Brisbane Central Station and got a-wanderin’. It was fast approaching lunch time so I went scoping for somewhere nice to get food and something to drink. Yeah, yeah, I know. Haha, I hope it’s not cloudy in Brisbane! Delicious honey chilli chicken. Doing it right, all times! So most of my day was spent doing that wandering thing I do when I get somewhere new. I headed out towards the City Botanic Gardens, lovely walks around there. Actually I’m not even going to say ‘it was lovely’ about anything else because frankly the whole day was full of lovely things. My wanderings led me over a footbridge to the South Bank, with it’s many walkways and gardens and parks and pools and bars and all sorts. The heat was starting to get to me so I made my way to the museum for a bit of relief. It wasn’t a huge museum but it had some fine exhibits, including that old favourite taxidermy. I got myself a mega iced coffee and hit the road, decided to wander back into the centre and get a better feel for the city proper. My journey took me back through the centre where I looked in some shopping centres and that, and ended up with me going around the wonderful Roma Street parkland. Now that’s a cool park to have in the centre of a city, set against a hill that drops to the lake, with a walk through what could pass for a rainforest. Remarkable stuff, but I’d done a lot o’ wanderin’ and my feet were starting to get grumpy. Best find a pub while I wait for Nat to get into town, eh? The sun’s goin’ down in ten seconds! Being the tourist that I am, I struggled to find a decent bar. I’d been told that Fortitude Valley is the place to be, but I figured there must be something half-decent near where I was because I couldn’t be bothered going too far. Well I ended up walking quite some distance before I settled on a bar – they all seem to be really swish and swanky, and let’s face it, I am the least swanky. Gimme a dive bar any day of the week. Anyways, I got my (expensive) pint and Nat eventually rocked up in her (swanky) Mitsubishi Outlander, and we made our way to her cousin Jess’s place out in Boonah (I know, that is the BEST name for a town). We had a couple of drinks and relaxed, while Jess told stories of the giant huntsman she’d had to tackle in her house (the one we were all sleeping in). we were all pretty bushed so we all got some kip, ready to rock and roll the next day. When I got up, everyone else had already been up for a while, I obviously needed a bit of a rest after all that excitement from the day before. Jess’s son Mal was up as well, he’s a topper of a kid. We were talking about sharks and frogs and a book he had about the Battle of the Mountains in New Zealand’s North Island. Anyways, the plan for today was to do a bit of explorin’ in the car and try and catch some swimmin’. First stop was the top of Mount French so we could get a good look out over the area near Boonah. We do like a good view, so we do. Jess and baby, Nat, and little Mal rockin’ out. We pitched off in search of a place to swim, eventually ending up at a small river at the base of a dam. Beyond the dam was a pretty big lake, folk going about in their speedboats and all sorts. Nat was only mildly envious of the perfect wakeboarding conditions and lack of wakeboard/boat. Someday Nat, someday. Just have a swim instead, eh? The top of this mountain would look like an elephant if my camera wasn’t being awful. We went to go for a swim in another river, but it was total dried up. There were some cows dossing about there as well, they obviously had the same idea but were equally dismayed at the effects of the drought. So we scrapped that idea and went to get lunch, before Nat and I headed back to Brissy (with me at the wheel, since Nat had been necking back the beverages since first thing in the morning. Natalie Prygodicz, ladies and gentlemen! Doing it right, all times). We’d had an excellent time in and around Boonah, but there was a party to attend. We had a bit of a struggle to find the apartment that Nat had booked out, and by the time we got there it was pretty much time to head out. So much for taking advantage of the block’s swimming pool! We got ready to head out and made our way back into town, making our way past said swimming pool which turned out to be the tiniest pool I’d ever seen. So we made our way to the venue which happened to take us on to South Bank again, I certainly wasn’t complaining. We got there, introductions were made, drinks were had, laughs were abundant and fireworks went off. Brisbane, I think I love you. At the end of the night we made our way back to the apartment, Nat got into her lovely big bed and I got into my, er, sofa. It was pretty comfy though, and in fairness, it was not cold. Yep, I like Brisbane a lot. For the last day we ventured out to Gold Coast, about an hour’s drive South of Brisbane. It’s a huge place, very impressive. It has more high-rises than Brisbane does and it’s pretty as. We got parked up and had a wee look around some shops and a plaza with all such as people drinking and bands playing. It felt like a proper summer holiday resort like what you’d get going on holiday to Greece or something, a bizarre feeling given how long it didn’t take us to get there. We hit up the beach and went for a wee plouter. Nat said she saw a blue jellyfish so that had me mildly freaking out when I was waist deep. Still, it wasn’t half nice to spend the afternoon relaxing there. She didn’t want to return the car. So yeah, after that we got one last drive of the Mitsubishi (we both loved it – it’s not my style, but I’m pretty sure my next car will be a Lancer or something), we got back to the airport, but not before filling it up with fuel. That was a trial! Good luck figuring out how to pop that petrol cap open. Finally we got it, Nat filled ‘er up while I faffed about reaching into the passenger side door only to find she’d splashed petrol all over my leg. Okay it wasn’t petrol but I was convinced she’d just gone mental, turns out she was just washing the excess petrol off the side with water. We took it back, donated our leftover beers to a very delighted gentleman in the rental place, and got on our respective flights back to sunny Melbourne. Y’all know I like a plane. 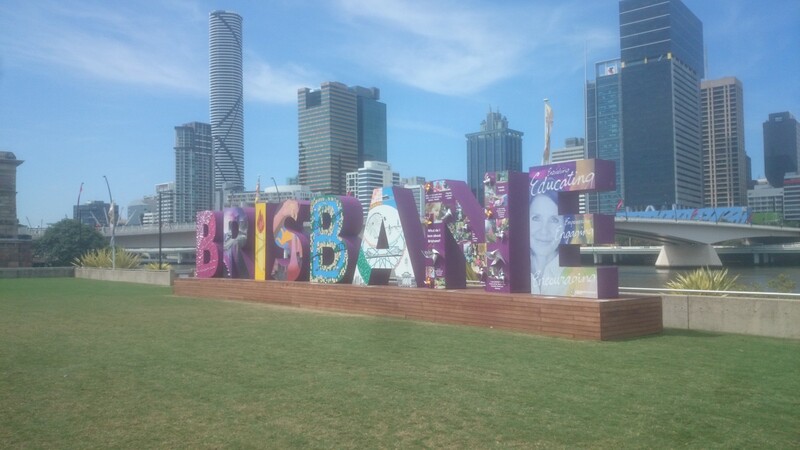 Well, I was fair smitten with Brisbane. Fine warm weather, beautiful city. I reckon it’s where I want to be. That’s not to say Melbourne’s a bad place, not by any means – it’s beautiful too, but certainly not as warm and as lame as it sounds, that’s kind of a big deal for me. Blame it on my gecko genes or whatever. Anyway, come January I’ll be moving up there. I’m also thinking I’ll try and get back into development work – I figure that if I want to be able to afford the things I want to do, I’m going to have to start making good money, and working in a bar ain’t gonna cut it. It’s good not having a plan!